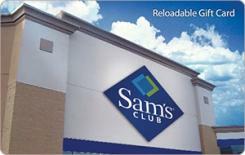 With a Sam's Club eGift Card, you get low prices every day on thousands of popular products in stores or online at Samsclub.com. You’ll find a wide assortment of top electronics, toys, home essentials and more. Plus, cards don’t expire and you never pay any fees. Prodege, LLC, is not affiliated with Wal-Mart Stores, Inc. or Walmart.com. The services, products, or activities of Prodege, LLC, are neither endorsed nor sponsored by Wal-Mart Stores, Inc. or Walmart.com. Wal-Mart and Walmart.com gift cards are sold by Giftango, an authorized distributor of Wal-Mart and Walmart.com Gift Cards. WALMART, Walmart.com, the WALMART logo, the WALMART.COM mark, the SAM’S CLUB mark, the SAM’S CLUB logo, and the SAMSCLUB.COM mark are trademarks of Wal-mart Stores, Inc., or its affiliates.